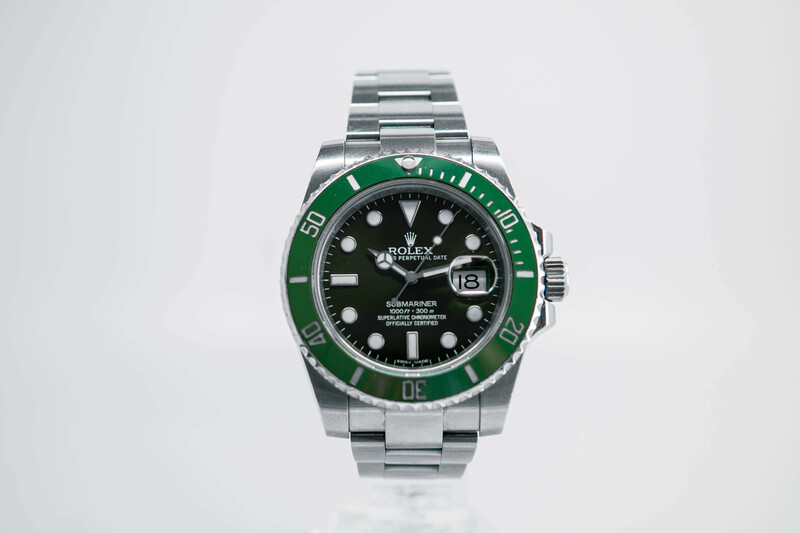 First of all (and bear with me here), let me begin by swimming against the currents of popular opinion, and say the Rolex Submariner ‘Hulk’ never really did it for me, and it wasn’t just the nickname or anything to do with green coloured pop culture characters. Even though it is a classic steel sports Rolex dive watch (and I do love classic steel sports Rolex dive watches), this one, with its bullet-proof tried and tested in-house caliber 3135 movement, solidly constructed 904L ‘Oystersteel’ polished case and brushed bracelet, with that superb integrated ‘Glidelock’ adjustment system hidden inside the elongated clasp, still wasn’t enough for me to see past the gawdy Green Lantern dial staring back from the hands of the owner of this particular Rolex Submariner ‘Hulk’, who had kindly entrusted it into my care for the weekend. 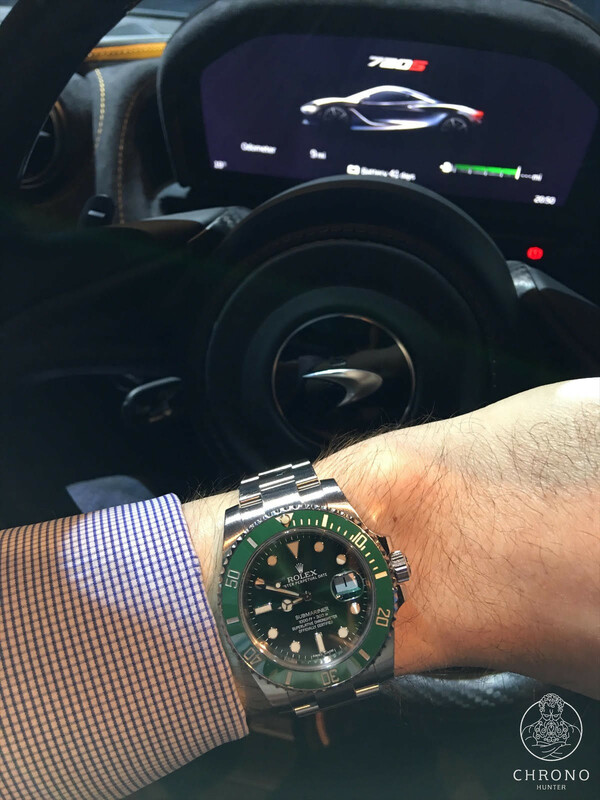 My 72 hours with the green machine aka the Rolex Submariner Hulk 116610LV got underway, with an exclusive invite-only launch event Friday evening, for the new McLaren 720S Spider supercar - certainly the only spider I’ve ever wanted to approach more closely without the need for a rolled up newspaper! 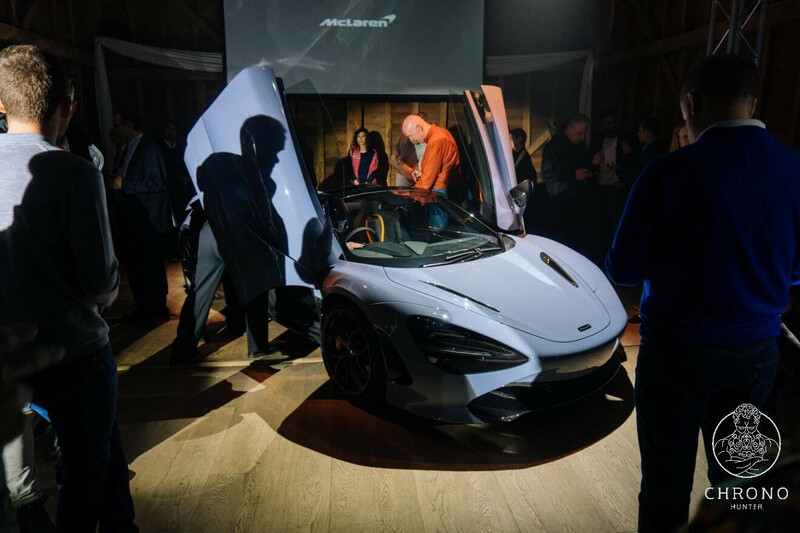 This new ‘zero compromise supercar’ certainly delivers the right juxtaposition of small numbers to offset the big asking price (a touch over £300,000 with a little dip into the optional extras catalogue for the one that we were presented on this evening). At the touch of a switch, in 11 seconds flat, the roof is down, and you can then bury the accelerator to inform the 4.0L twin turbocharged V8 of your intent to be propelled from 0-62mph in just 2.9 seconds from a standing start, and you can keep the roof down and the wind in your hair all the way up to an impressive 202mph. It was here, in the striped back, minimalist rustic chic of one of the more intimate converted barns at the Tewin Bury Farm Hotel in Hertfordshire, under the staging lights of the area illuminating the new supercar, that I picked up my first, ‘nice watch’ compliment, about the green monster protruding from under the cuff of my evenings chosen attire. It’s a funny thing, as a watch enthusiast, I long for the moments when a fellow horological hobbyist notices my choice of casual wrist wear, however, more often than not, in this situation, it always happens that as enthusiastic as I am on the subject, I can think of nothing more interesting to reply to their initiated opinion other than, “Thanks”. It came as more of a surprise though, for this room was absolutely awash with Royal Oak’s, Patek’s, and I’m sure I even caught a glimpse of a Richard Mille RM10 as some guests were busying themselves with drinks and canapes from the assembly of circling waiters and waitresses, yet, here was a favourable compliment towards the humble Rolex Sub. Weird thing watch lovers.. But wait, I tell myself, I’m currently wearing one of the most popular steel sports Rolex watches of the last decade, this century even! A watch that currently has pre-owned retailers asking prices of up to and above £5,000 in excess of the £6,950 recommended retail price (and that gulf between RRP and re-sale isn’t showing any signs that we have reached the limit of the potential value to be seen in the coming years), so of course, it’s going to pick up the odd compliment or two. This shamrock in steel toecaps still has the power to turn heads nearly eight years after its introduction as successor to the 2004 anniversary 16610LV ‘Kermit’ Submariner, that it replaced after production came to an end from a run of just seven years. So why has demand, and indeed the price sky rocked over the last couple of years for this emerald eye catcher and it’s fellow super hero nicknamed contemporaries? Rolex Authorised Dealers are in a drought right now of the popular steel sports models of which we had all become so comfortably acquainted. ‘Batman’s’ ‘Pepsi’s’, even the humble Explorer 214270 now rarely to be seen inside of the AD display cases, the words “I’m sorry, the list is now closed” must surely be the new strapline to the next big Rolex advertising campaign. The next morning brings with it the normal antagonised response to my alarm, although now that it has fully migrated itself from the robust travel clock of yesteryear to the somewhat susceptible smartphone of today's day and age, it is spared a swift chuck across the room as once befell its predecessor, for further glorious eight minutes of shuteye. Once up, dressed, and out for breakfast on a day that teases spring is just around the corner, it’s in a casual glimpse of my wrist in the natural morning light of this early day in March, that the point of this watch just clicks, as smoothly as the ‘Cerachrom’ bezel, and it takes me but a few seconds to go from being moderately interested in this butch Yoda, to being full on transfixed as such a rich dispersal of green hues reflect themselves from the sunray dial and greet me square in the pupils. 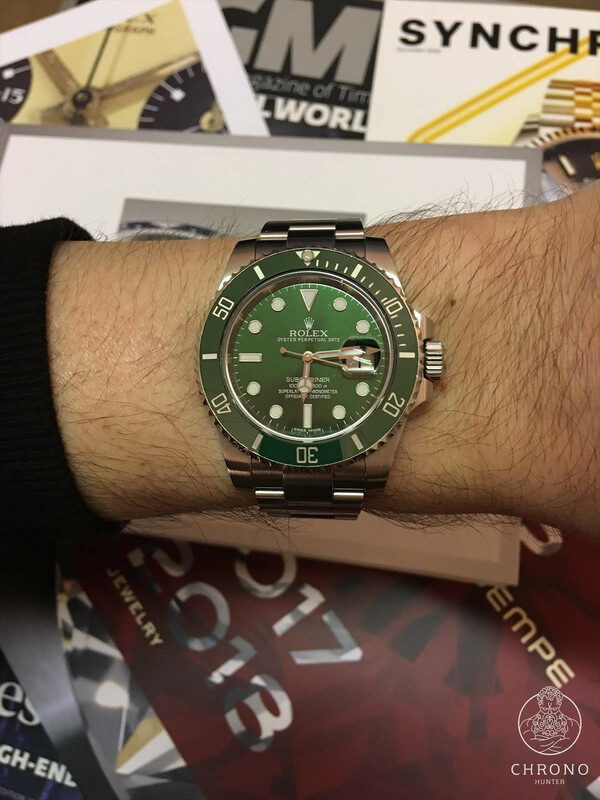 I’m starting to realise just at this moment why so many people crave to get their hands on this Jolly Green Giant Rolex Submariner Hulk 116610LV. A double, no, triple look to establish at what time we parked up in the car. Check. (Although it was free parking all day). 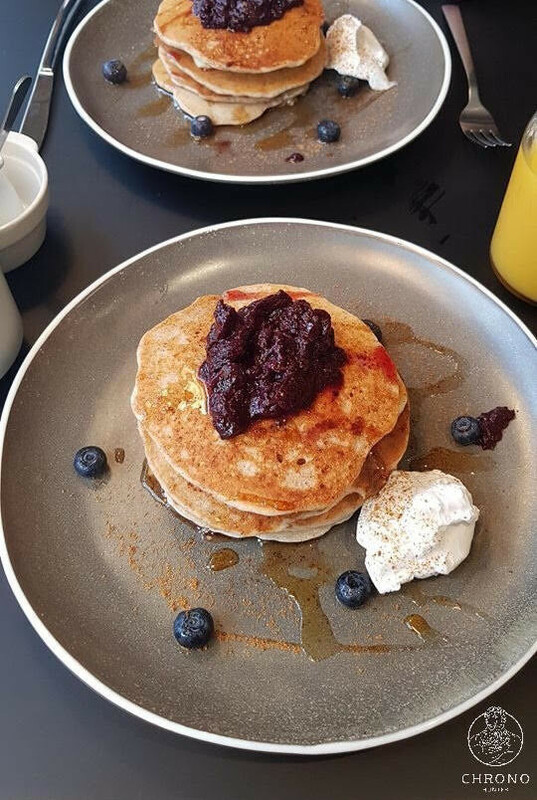 At what time did we order the coffees and the moorish blueberry pancakes that my wife and I are so equally fond of from the menu in the little vegan cafe we seem to frequent most Saturday mornings, and how long exactly does it take the host to bring the coffee from said order. Check. (two minutes, four seconds on the coffee). You see the theme developing here I’m sure. Sunday’s necessary housework brings an entirely new villian to challenge the Green Arrow...Washing up! With a specified dive rating of 300m thanks to the combination of the screwdown ‘Oyster’ case, ‘Triplock’ winding crown and thickened sapphire crystal, water resistance on the wrist is assured when doing the dishes, even if it does conjure up a similar parallel of overkill in the real world, as it would to using the 212mph McLaren 720S Spider to do the school run in a small village - the words ‘sledgehammer’ and ‘nut’ come to the forefront of my mind. And so on to my final day with the Green Goblin, and my scheduled goodbye to the Rolex Submariner ‘Hulk’ 116610LV. Settling into the chair at my desk Monday morning in Chrono Hunter HQ, the watch has once again returned to it’s natural stomping ground, and proudly reclaims the throne in my opinion as the current king of the desk divers. Throughout my time with Switzerland's very own Bruce Banner alter ego, The Incredible - Rolex Submariner - Hulk, at times I was very conscious of walking around with this bright green bullseye beneath the sleeve of my sweatshirt, I never really gave any more than a second thought to the attention that a wearing a watch as instantly recognisable as the ‘Hulk’ could potentially be advertising the wrong sort of people, with the wrong sort of ideas. I’m sure many of us have read or heard a story in the news over the past year or so about individuals or couples being targeted for their own high value possessions in the streets and in their own homes. Unfortunately, smartphones, luxury watches, handbags, diamond rings and flashy sports cars all seem to be fair game to the would be criminals of the world in which we now find ourselves. I feel that the decision to own and enjoy these sort of high profile coveted items, and bring them out into the real world with you is not necessarily to challenge what could arguably be an avoidable risk, but more an active choice and a statement of defiance to fully enjoy one's possessions, and find your own form of fulfilment from the decision made to treat yourself to this sort of luxury item in the first place. Anyway, what with jealousy being the green eyed monster and all, it’s now Wednesday afternoon, and I do still have some other guys expensive Rolex on my wrist, and I just don’t know if I’m quite ready to give it back myself..
April Fools: Rolex Daytona & Patek Philippe Nautilus available at Retail Price Today Only!